Different couples have different ways to explain and describe their love and relationship but many people talk about butterflies when it comes to detailing the love that they share. Butterflies are beautiful creatures that often take a while to reach their true potential, so there is that aspect to them which fits neatly with a strong relationship, but there is also the fact that when many people look at the person they love, they get butterflies in their stomach. 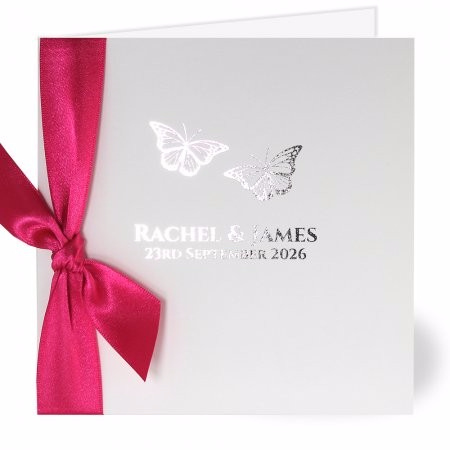 This means that the use of butterflies on a wedding invitation is an excellent choice and the foil imprint of butterflies on the card creates the perfect tone and mood for the happy event. This creates a stylish and understated card but in the right light, it is a card that catches the eye and practically dances for joy. The versatility of the card is something that will appeal to many happy couples, acting as the perfect introduction for their big day. The front of the card also comes with the name of the bride and groom and the date of the wedding, ensuring that everyone knows all about the happy event. 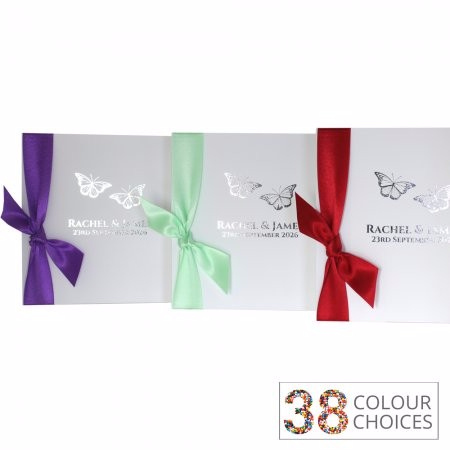 Ribbons are also provided with the invitation, adding a further dash of colour and allowing couples the opportunity to stamp their personal style and taste on the invitation. Any couple that has a theme for their happy day will find that the ribbons help ensure everything is on point in the lead-up to the big event. With a guest naming print service also available, this is a wedding invitation that can be completely personalised, making it more of a special occasion. Order from Chapter One Press.